Andar a caballo es una terapia en sí mismo, pero si a esto le sumamos un paisaje agreste en dode el campo se junta con el mar, increíbles vistas panorámicas, escuchar un relato sobre la historia del lugar que se está recorriendo y un intenso galope para obtener una buena cuota de adrenalina, la experiencia se transforma en una vivencia única e irrepetible que sin duda se conservará para siempre en la memoria. To walk to horse is a therapy in itself, but to this we added a rustic landscape to him in dode the field is joined with the sea, incredible panoramic views, to listen to a story on the history of the place that is crossing and intense galope to obtain a good quota of adrenalin, the experience is transformed into a unique and unique experience that without a doubt will be conserved for always in the memory. 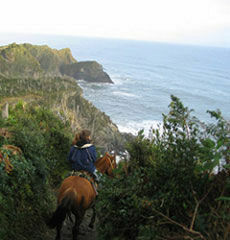 Esta es la propuesta que Mundo Ecuestre tiene preparada para sorprender al turista que se acerque a su establecimiento en Horcon y que desee realizar una salida por los Campos y bosques en auténticos caballos chilenos. Las cabalgatas se pueden programar para que sean de una, dos o tres horas, según las ganas que se tengan de montar. This is the proposal that Equestrian World has prepared to surprise the tourist who approaches his establishment in Horcon and that wishes to realise an exit by the Fields and forests in authentic Chilean horses. The cavalcades can be programmed so that they are of one, two or three hours, according to the desire that must to mount. A medida que avanzamos, nos vamos encontrando con trabajadores rurales y con vacas lecheras junto a sus terneros, mientras que la naturaleza nos va acogiendo en su interior. As we advanced, we are been with rural workers and milk cows next to its veals, whereas the nature is to us welcoming in its interior. Una intrépida subida hará que disminuyamos el ritmo. A paso cansino pero continuo alcanzamos los puntos mas hermosos de la expedición. An intrepid ascent will cause that we diminish the rate. To cansino but continuous step we reached the beautiful points but of the expedition. Finalmente, tras disfrutar de aquella obra natural, se emprende el regreso hacia el establecimiento de Mundo Ecuestre . La vuelta tendra su dosis de adrenalina, ya que en un llano nuestro guía nos permitira cabalgar y sentir la fuerza del animal que nos transporta. Finally, after enjoying that one natural work, the return is undertaken towards the Equestrian World establishment. The return tendra its dose of adrenalin, since in level a our guide permitira to ride and to feel the force to us of the animal that transports to us.